Bio: Sandra's formal artistic training began at Michigan State University and she earned a BA in 1989 from Aquinas College in Grand Rapids, Michigan. Since then, she has engaged in various postgraduate programs and studied with Larry Blovits, Albert Handell, Morten Solberg, Carole Katchen, Gil Dellinger, Bill Hosner, Doug Dawson, and Alan Flattman. Sandra spent ten years (1990-1999) as Art Program Director for the Franciscan Life Process Center in Lowell, Michigan, where she developed an Artist in Residence program. 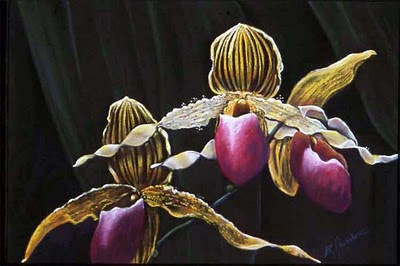 In June 2004 the Pastel Journal featured an article, called "Pastel on canvas", about Sandra and a new pastel technique she developed that does not require framing in glass. Sandra spends the winter months painting in Naples, on Florida's Gulf Coast, and the summer in Grand Rapids, Michigan. Subjects: Floral, Figurative, Landscape, Wildlife. Navigation: Main menu remains available at all times. Navigation through galleries and images is easy, with multiple choices presented. Gallery: Six pages in sequence of large thumbnails that enlarge to a slideshow when clicked. These are accessed via the Gallery link; Works for sale is redundant.